Imagine this: A zero-gravity chair in a quiet campsite with a great view, plenty of sunshine and a large glass of vino. Am I right? Who doesn’t love camping with your favorite wine? I did just that with my family a couple of weeks ago, taking along my favorite Oregon Pinot Gris and a couple of wine glasses. Usually I camp bare-bones, taking only the essentials. Wine and wine glasses are a little bit of luxury, and as close as I get to “glamping”. I don’t allow myself to enjoy much down-time, but on that weekend, I thoroughly enjoyed a little slice of a sunny, nature-inspired R&R while sipping my cold wine. Happy place, indeed. As I was partaking, I happened to glance down at the our wine glasses placed on the old tree stump and saw Mt. Bachelor, upside-down, reflected in the glass. Hello! Amazing painting alert! No amount of relaxing is going to prevent me from going all creative-crazy. I took a quick picture or 20, excited about the prospect of re-creating the scene. 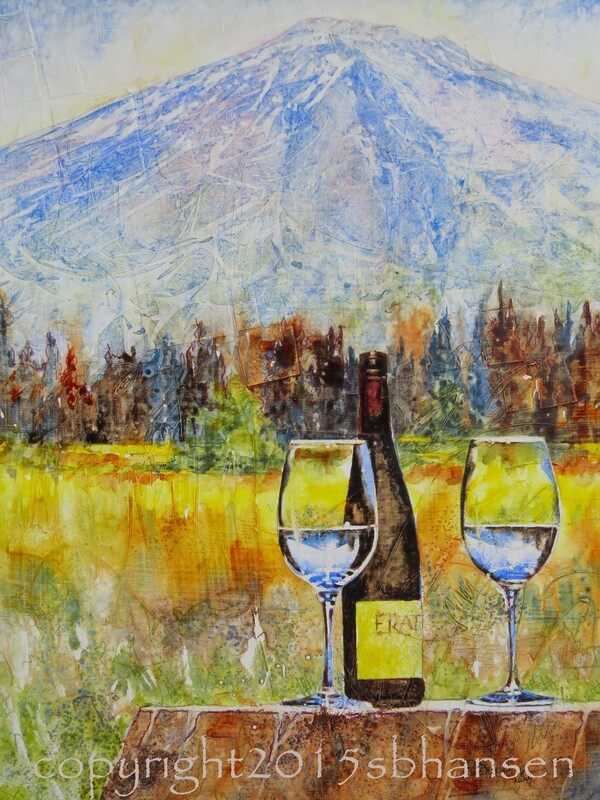 In the painting, I wanted to illustrate the idea of relaxing in the mountains with a bottle of wine on a beautiful, sunny day, while showcasing Mount Bachelor, both in the background and in the wine glasses. A little tricky, if I do say so myself! 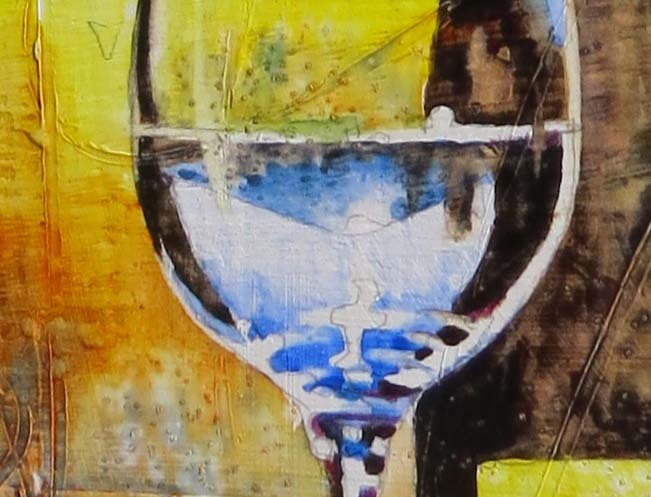 Because the glasses were the focal point of the painting, and important to get the feel of them right away, I began painting them first, touching the areas of interest with pure cobalt blue, to reflect the sky. I began to lay in the background colors. 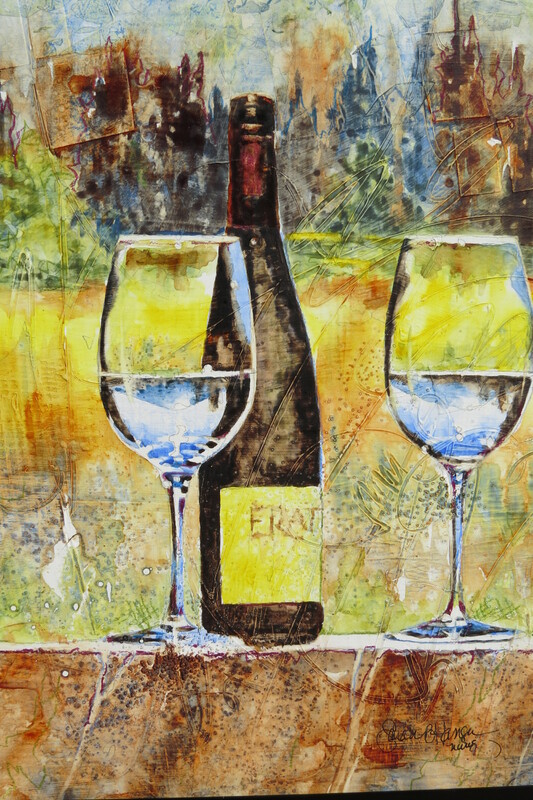 I did not stray far from localized color, painting the scene similar the natural color of the grass, which highlighted the blue of the wine glasses. The trees are a darker value, a variegated mixture of purple and blue, which blended better with my color scheme than green would have. 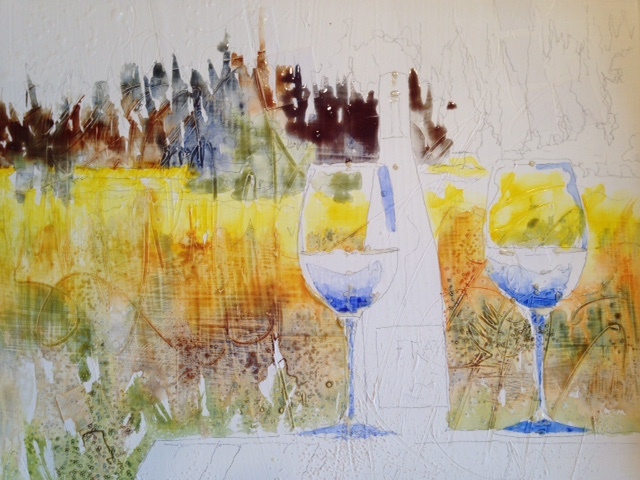 After I established the background, I began to work on the bottle. I chose to make the bottle darker than reality, continuing the hue and value of the trees to the bottle and creating a “T” composition. At this point, I began to pull out detail in the glasses as well. In the photo above, can you see the texture in the background? 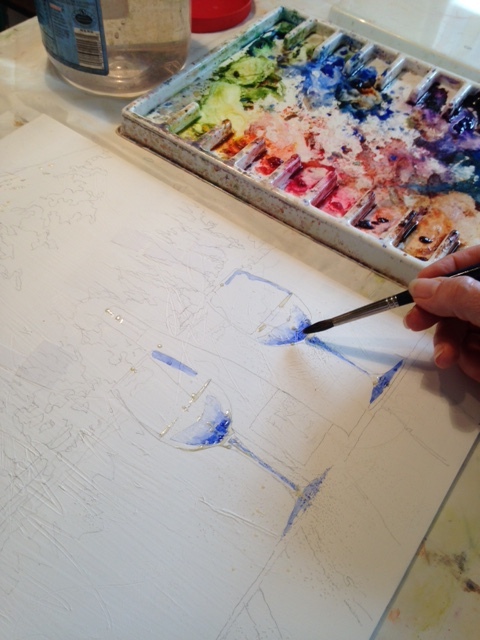 It was created using salt, which had been adhered to the gesso before I began the painting. I worked on the stump next, enjoying all the texture from the salt and gesso scrapes…it helped add character to the old wood. I finalized the detail in the glasses and bottle as well. Mt. Bachelor in the glass. Isn’t it cute?! The above detail demonstrates the texture in Mt. Bachelor. 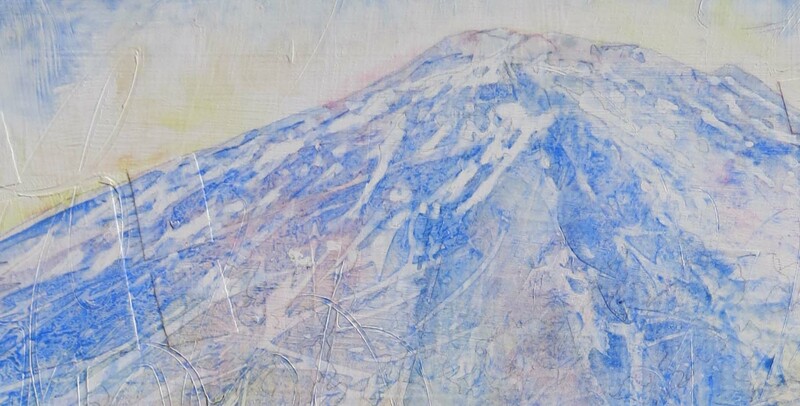 The overall texture in the mountain has been created using crinkled plastic wrap, placed carefully over a very wet wash on the mountain, then allowed to dry. 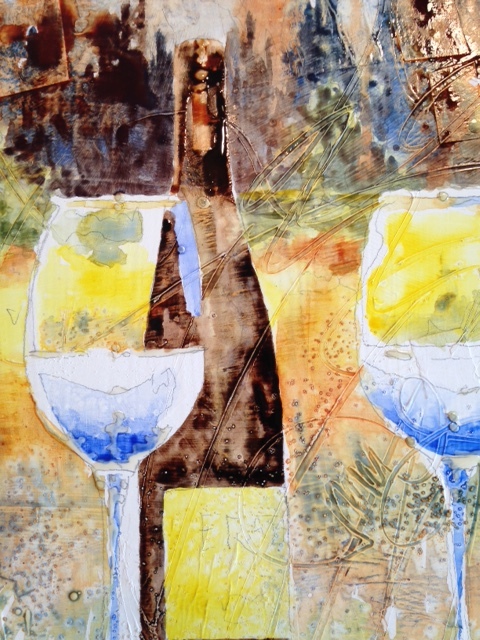 Squares of paper collaged here and throughout the painting add random pattern to the work. The mountain has remained subtle, however, allowing the wine and glasses to take over the show. Texture and color in this painting are a sight to behold! I love it! And what’s not to love? 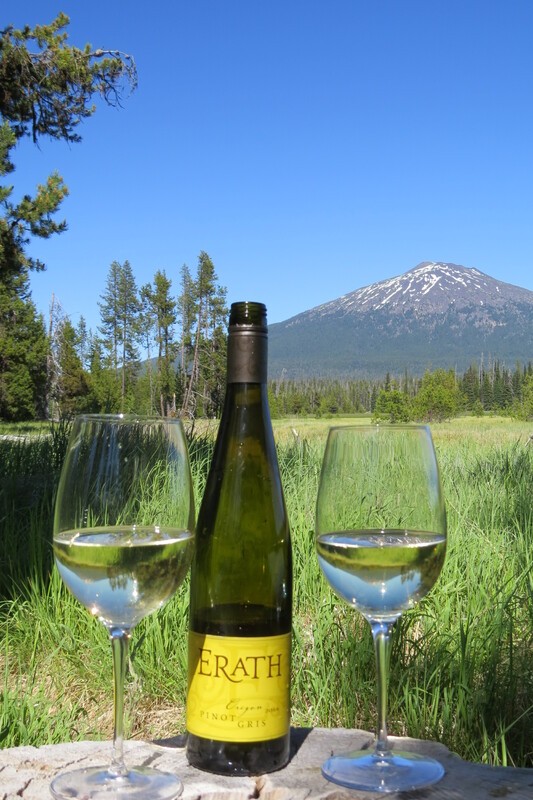 Oregon wine, sunshine, and mountains! Hope you love it, too. “Happy Camper” is currently at Hood Avenue Art. Stop by and see it in person. Questions? Send me an comment. Prints available, sizes starting at 8×10 for $25.